It’s no secret that money makes the sport’s world go round. Money benefits every side of the sport. From the athletes to the promoters, everyone makes more money if the event is a success. Therefore, the promotion leading up to these events is often the most important part as it is the hook for people to tune in and genuinely want to see what will happen. However, sometimes promotion just for promotion’s sake ruins sports. Such is the case in the ongoing saga of Floyd Mayweather and Conor McGregor. 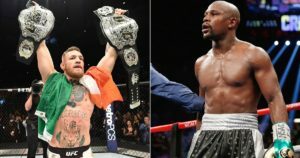 For over two years now, Mayweather and McGregor have been linked to a potential “superfight” in what would no doubt be a pay-per-view blockbuster, breaking every single viewing record to date. Both are mega-stars and have no problem selling pay-per-views on their own. For example, Floyd sold over four million pay-per-views in his fight versus Manny Pacquiao, in a fight that generated over $410 million in revenue. Mayweather has also surpassed the million mark 7 other times in his boxing career, making him no doubt the biggest draw the boxing world has ever seen. On the other hand, Conor McGregor, who calls the Ultimate Fighting Championship his home, hasn’t been doing too badly for himself either in terms of drawing power. Leading up to his first title opportunity in December of 2015, the UFC had only surpassed the million-buy mark 8 times in their history. Since that fight McGregor has passed that mark 4 times in only one year’s time, including 3 times this past calendar year. There is little to no doubt that these two, even though Mayweather is now technically retired, own the pay-per-view game in their own sports. The question remains, however: Why tease a fight between these two when everyone knows what will happen? The proposed fight between these two would not only make a mockery of boxing, but also of mixed martial arts as well. The proposed fight between the two would take place inside the boxing ring, where Mayweather has amassed an incredible 49-0 record, taking on all-time boxing greats Oscar De La Hoya, Juan Manuel Márquez, Victor Ortiz, Canelo Álvarez, and Manny Pacquiao in the process. McGregor himself has never stepped foot inside a boxing ring. This is no fault of McGregor’s as he has been taking the MMA world by storm. However, how can one expect him to compete with someone who has a boxing pedigree like Floyd’s, having never stepped in the ring? The same would be said of Floyd had he decided to make the jump into MMA and face McGregor. McGregor has a record of 21-3 inside the octagon, while Floyd has never had a fight. McGregor would make short work of Floyd under MMA rules, while Floyd would destroy McGregor in the boxing ring. It is not a slight on either competitors abilities, it is simply just the facts and how fighting works. Therefore, no matter how many times they mention each other’s names, make fun of each other, or say that the fight will happen, it will not matter. The end result is it will lead to a lot of promotion with little actual substance when they step foot in the ring. Both need to stay in their own lane and look to build up their own sports rather than their own brands and names.